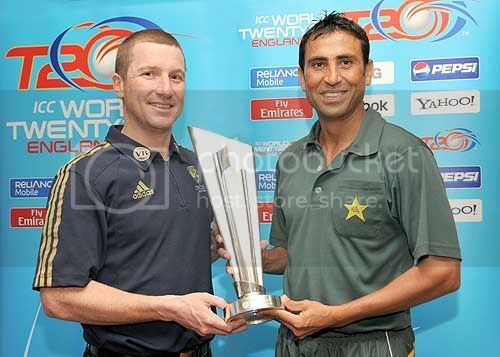 Here are Younis Khan and Brad Haddin posing with the T20 World Cup Trophy, a couple of hours before the Gala Dinner that was hosted on Tuesday night. Strange why they were posing with the World Cup Trophy and not with the one they will be playing for tonight. Australia's and Pakistan's preparations for the T20 World Cup start tonight as they clash in the final match of the Chapal Cup Series. It will be the first ever T20 International to be played in the UAE and it will be the last day of my stint with Dubai Sports City. The match will be played in the Ring of Fire and the news is that it will be a full house. None of the ODIs have had full houses yet, which has been slightly disappointing. But tonight's match has promised a lot of entertainment and has the potential to be a lot of fun, so it could very well be a sell out. The match itself should be a close contest considering the way the ODI series has been played. Both the ODI's hosted in Dubai were low scoring games, so I would not expect a high scoring 20-20 game. I have a feeling the ball will do most of the talking once again. Umar Gul and Shahid Afridi are very dangerous 20-20 bowlers and will be worth their weight tonight. While Shoaib Akhtar in a 4-over spell can be potentially lethal. Doug Bollinger has had a magnificent debut series and would like to cash in further on his success. Ben Hilfenhaus, Stuart Clark, and Nathan Bracken have all been a handful for the Pakistanis and will continue to threaten today. Plus, with the wicket providing a lot of spin, the Pakistani trio of Afridi, Malik, and Ajmal, along with Nathan Hauritz, will surely come into play. I think its going to be a tough time for the batsmen. I'm going to be at the ground, on duty for the last time. I will be around at the media centre but I plan to be a part of the crowd as well; something I have not done at the Dubai Sports City Cricket Stadium; hence I will not be reporting live from the ground. But I will post after the game is over and will have more pics for you as well! The best part about tonight is that the Dubai Sports City Magazine comes out - it will carry my first ever published articles. A 20-20 match, Pakistan and Australia, Dubai, a magazine with my articles, cricket, fully packed stadium, and a whole lot more - not a bad way to spend a Thursday night! let me be the first one to congratulate you on your articles, good read it was and i suggest if its no copyright infringement you should post them here on the blog as well! This is what a Mr. Sidharth Monga from cricinfo is saying: "Australia had fielded almost a second XI, and played like that." Now was this guy watching the same match as we were? correct me if im wrong, i believe that out of the 11 who played today 7 of them are an automatic selection for the Aussie T20 team! its far very far from a 2nd XI! I think im going to do a post abt Mr. Monga .. thanks for pointing it out to me..